Comm Eye Health Vol. 16 No. 45 2003 pp 07 - 09. Published online 01 March 2003. As eye health workers, we give much attention to learning and teaching the importance of health education and the prevention and treatment of eye disease. 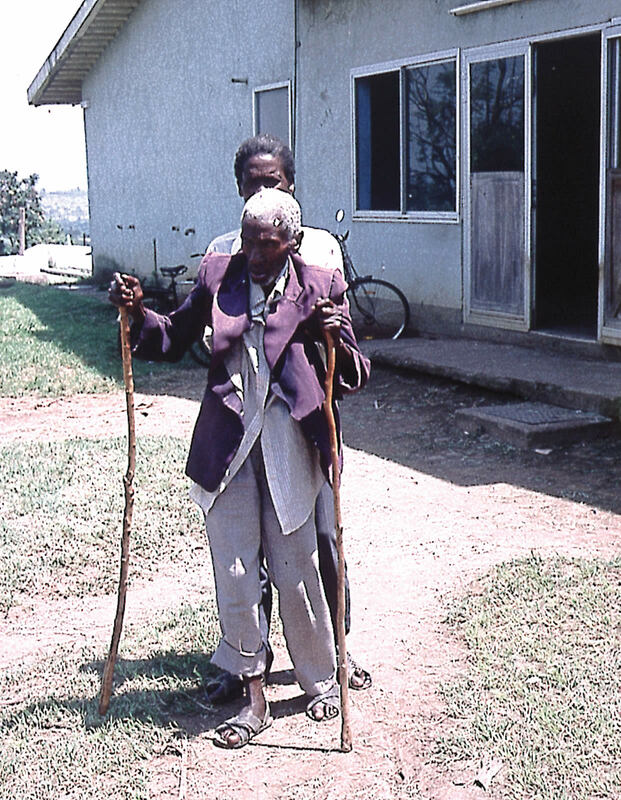 Despite our gained knowledge, sadly, our efforts are not always successful and we are presented with the responsibility and challenge of caring for people who have to cope with visual impairment, perhaps for the rest of their lives. We have to understand their difficulties, recognise their abilities and learn how to cooperate and communicate with them in a social as well as hospital environment. It is often within the eye hospital itself that the lack in education of health workers and their understanding of the assistance needs of blind and visually impaired patients is all too evident. Such people have many abilities and can achieve many things despite visual impairment or blindness, but there are times when they will appreciate and welcome practical assistance. Fig. 1. Meeting and greeting. Always ask first before offering any help and do not be offended if it is refused. Some people have had very bad experiences of what a sighted person thinks is being helpful! Once into a conversation, never leave without saying you are doing so. 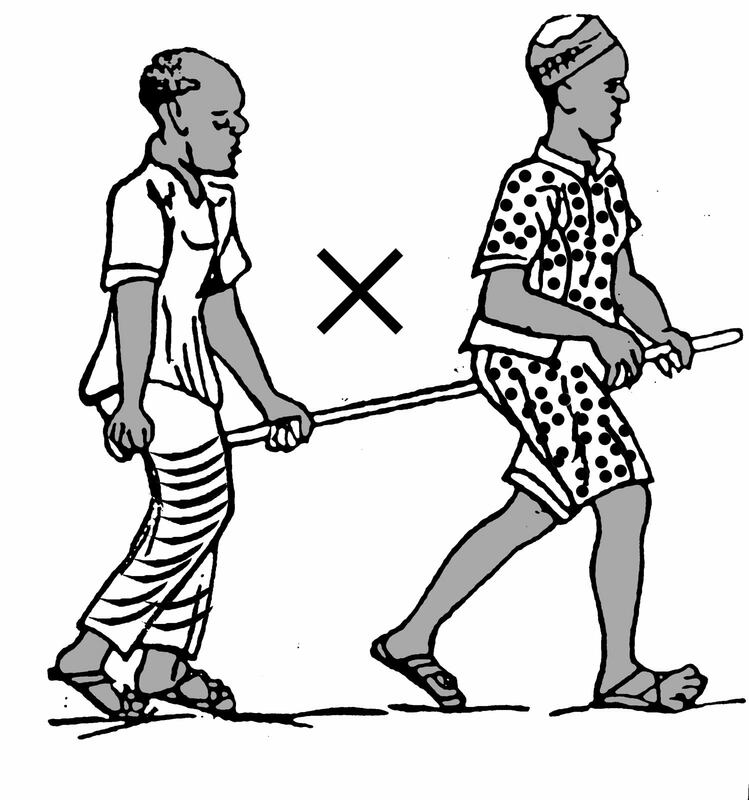 Do not allow the blind person the embarrassment of talking into the air! 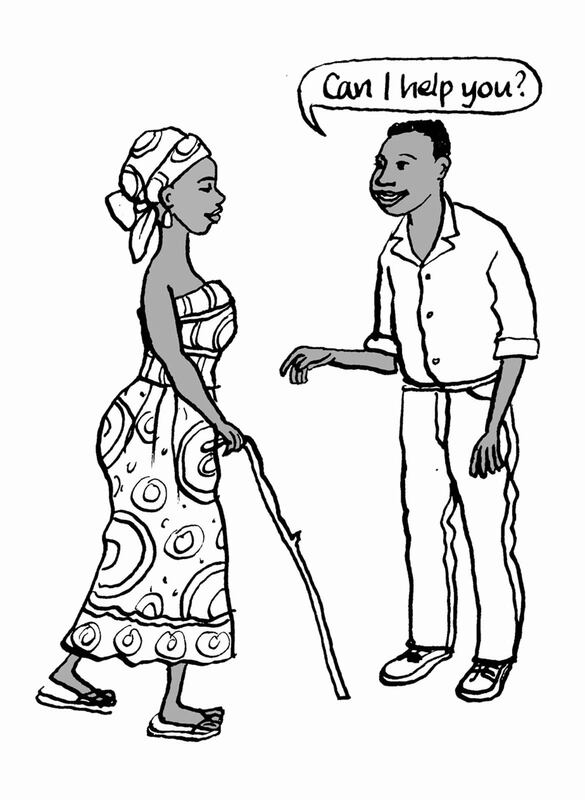 Do not expect or invite others to speak for blind people. 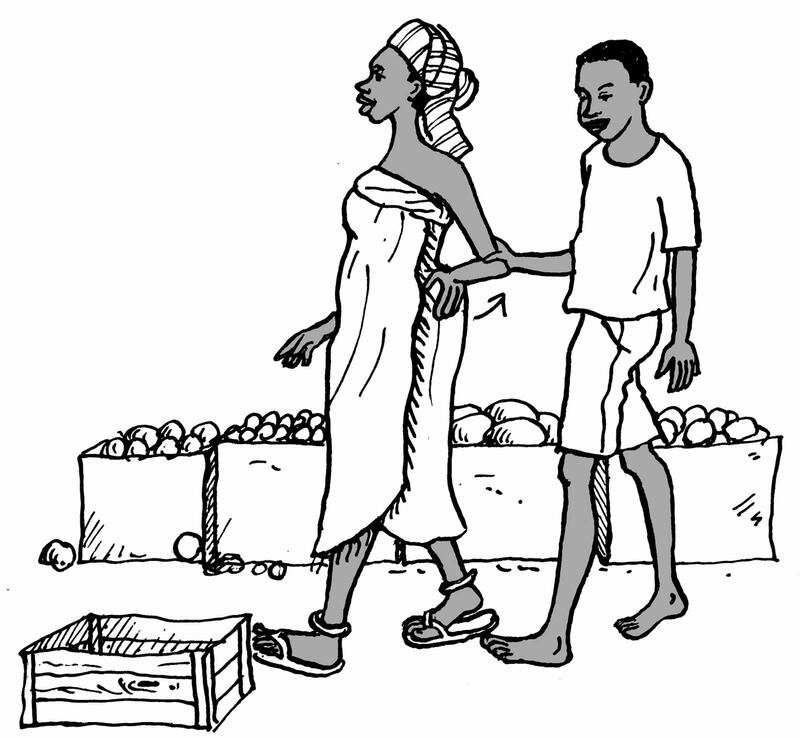 Do not be afraid to ‘touch’ but be sensitive to cultural differences. If there is a guide dog, but extra help is needed, approach and walk on the other side. The animal has been trained to understand that he is still in charge and responsible! Describe any sudden changes in the environment. It is also very important to explain changes in ground surfaces and especially when moving into wide open spaces, e.g., fields. Fig. 3. Walking in single file or in narrow spaces. Your partner should automatically step in behind you, still holding your arm, and together you will be able to negotiate a narrow space. 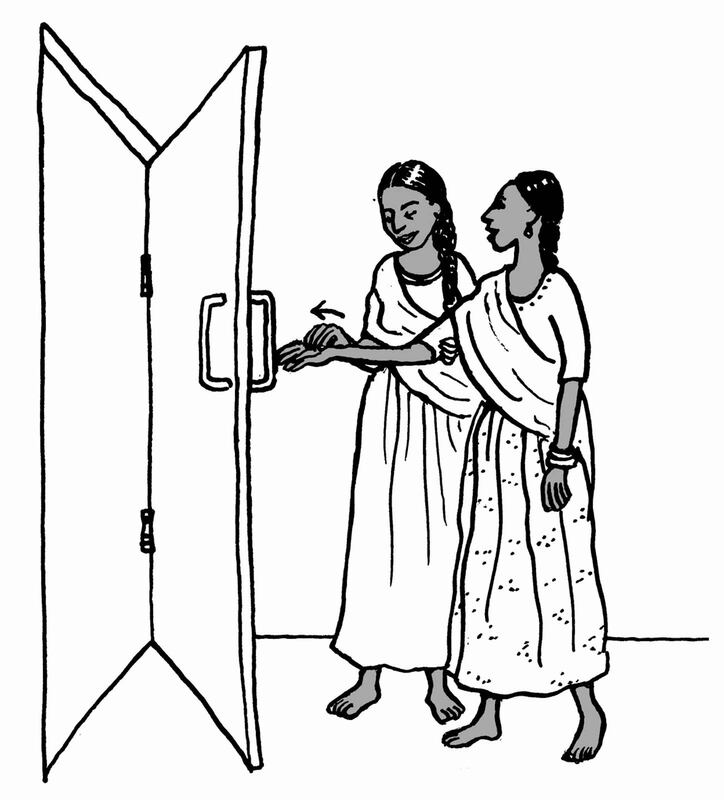 He/she should then follow you through and close the door behind both of you. Fig. 5. Steps, stairs and slopes. 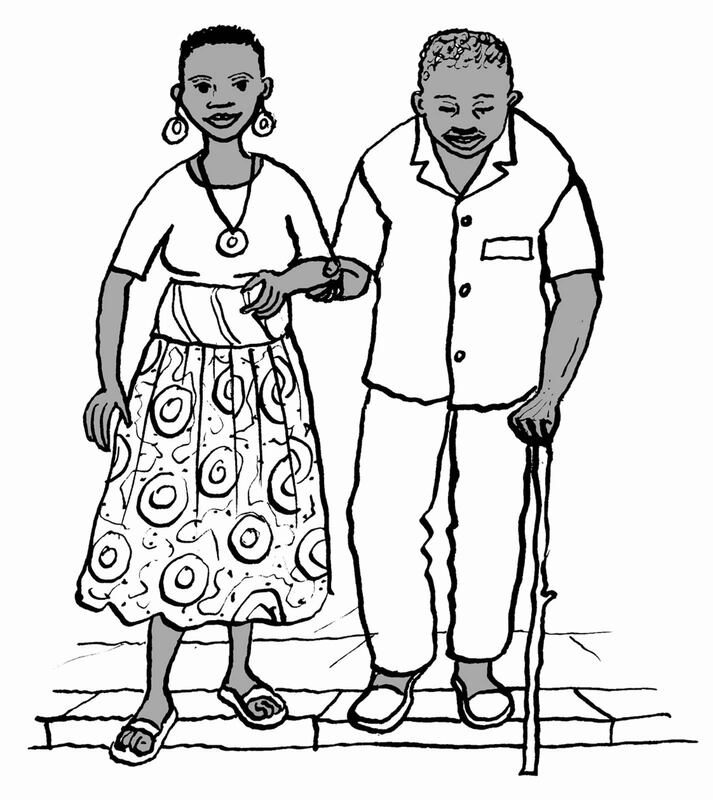 Tell your partner whether the steps, stairs or slope go up or down. Going down is more difficult. 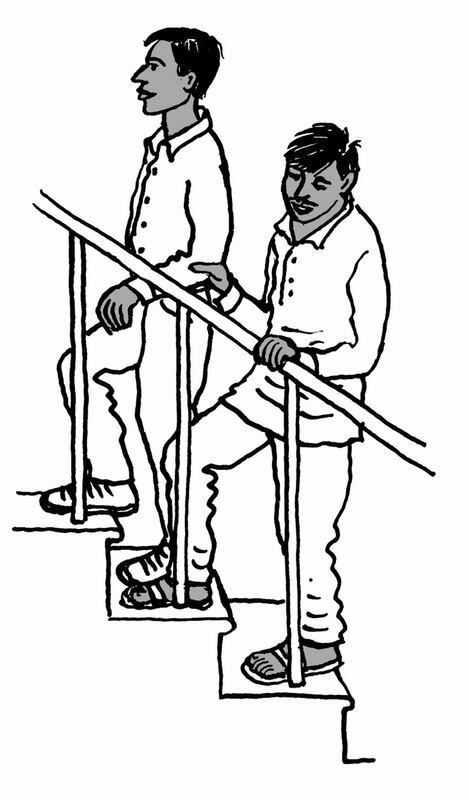 Go one step ahead and take a slightly longer stride on the last step to allow your partner space. Fig. 6. Kerbs and roads. 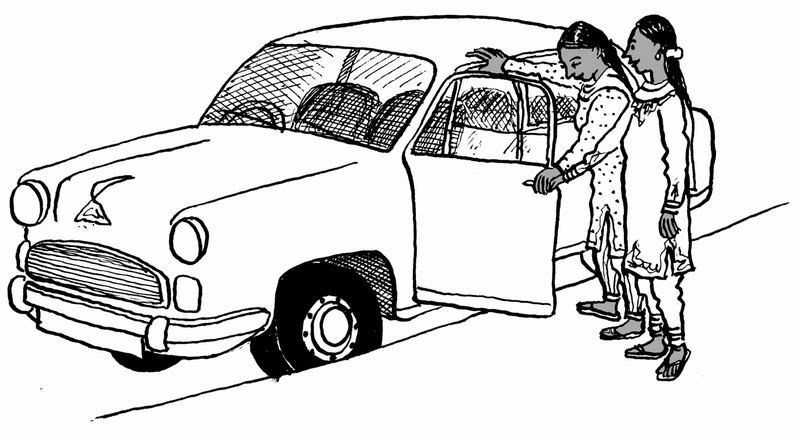 Tell your partner if you are parting company after crossing the road and ensure they know which way they are facing. 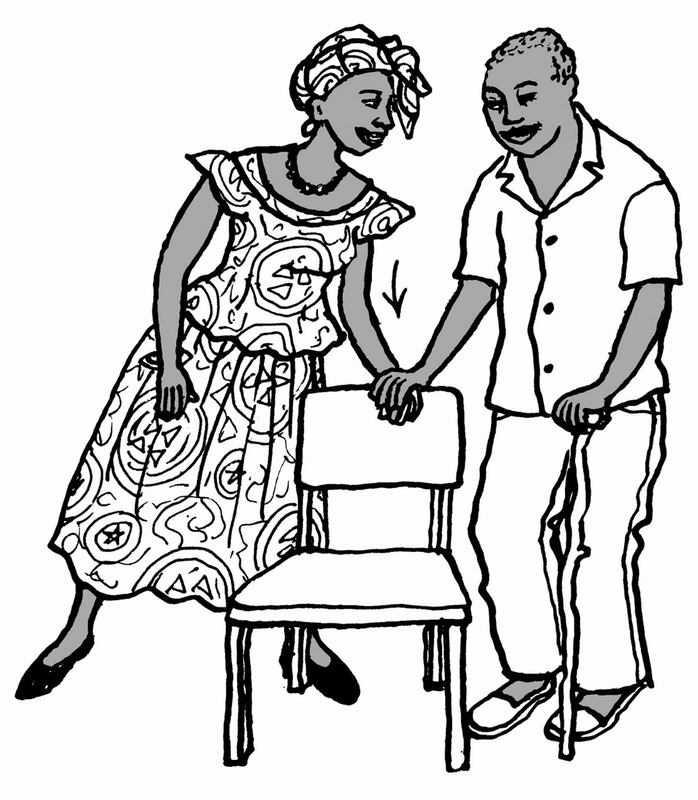 Never propel or steer a blind or visually impaired person backwards into a seat! This is sufficient help as your partner will now be able to judge the height of the seat and will be able to sit safely and at his/her own pace. Tell them if there are wider than average gaps to cross – this is particularly important when travelling by train! Always lead your partner on and off public transport. In rural areas, extra help may be needed when you and your partner have to negotiate getting on and off unstable modes of transport, e.g., carts, boats, etc. Remember your patient is at the hospital because they cannot see well – sadly, an often seemingly forgotten point, even by the more senior or so-called experienced staff members! In the treatment room, always explain what you are going to do – and to which eye! An unaccompanied patient who may be unable to hear, as well as having sight problems, may benefit from taped information to take away and share with family at home. Fig. 10. ‘Walk with me!’. Eye health workers have a responsibility, and an important position, for teaching others about assistance to the visually impaired. But we must be seen to be practising what we teach. A community-based rehabilitation project in Uganda, some years ago, used a very appropriate and challenging means of raising awareness. They provided T shirts for the project team members with illustrations and slogans which read, ‘Don’t pull me’ (front – see Fig. 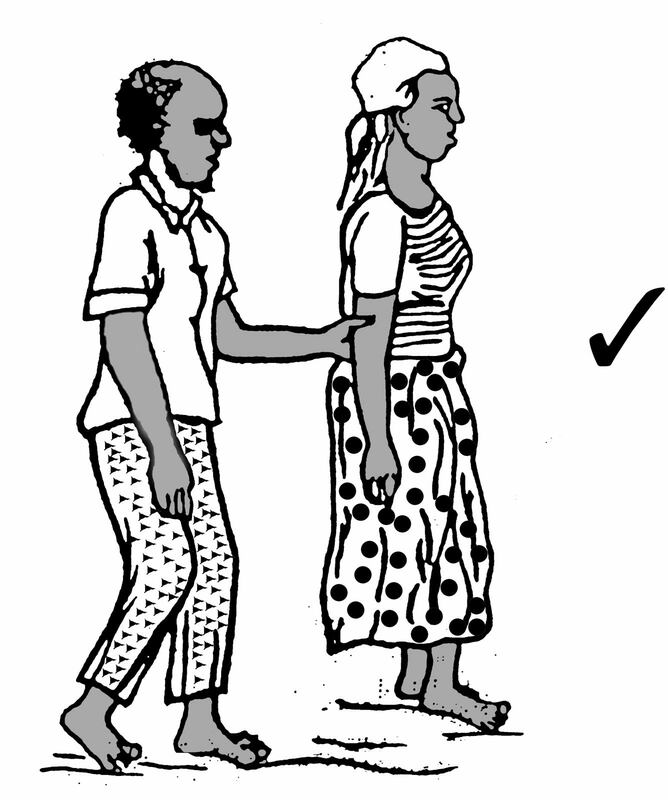 9) and ‘Walk with me’ (back – see Fig. 10). Can you think of similar activities, perhaps? The Royal National Institute for the Blind, UK. 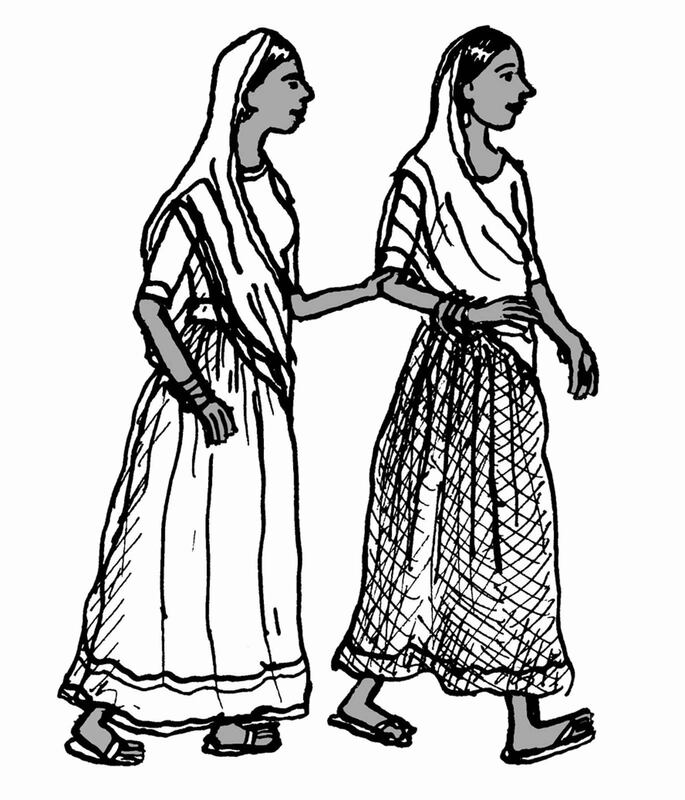 Illustrations (Figs. 1-8) by Teresa Robertson. My thanks are also due to the many visually impaired patients who have helped me to understand their needs and taught me how to help them.